The delicate beauty of the hand-stitched needlepoint rug has existed since the times of William the Conqueror in 1066 A.D. Made popular in the 17th and 18th century salons of Europe, this enchanting rug is stitched in pure wool and available in a wide variety of sizes and styles. Needlepoint is more accurately described as an embroidery rather than a weave. Woolen yarn threaded through a needle is stitched by hand into a cotton meshed canvas which is stretched horizontally between wood poles. While there are a multitude of variations on the needlepoint stitch, the basic needlepoint technique has developed independently in virtually every major civilization on earth. Needlepoint is prized for its clarity of design which results from the pointillist nature of the technique. Needlepoint carpets can employ more than one hundred different colors giving an unparalleled level of richness and depth to the design. An experienced worker requires about one week to complete just two square feet of needlepoint. Eight to ten skilled artisans working together often take several months to complete just one carpet. If you are looking for a gorgeous needlepoint carpet you may want to see Wiltons. The Wilton power loom weaves the wool and creates the most beautiful patterns. 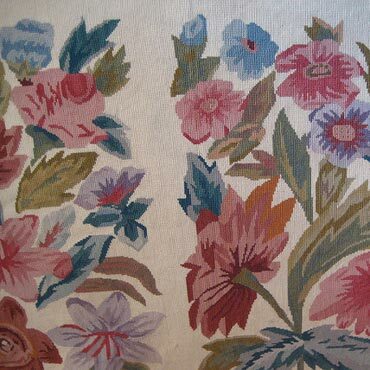 If you like a trellis design or an intricate floral there are many needlepoint to choose from. Many patterns also have coordinating borders which can be installed around the perimeter of your room or used to make a beautiful finished rug area.